One final push for the Community Fountain project in Silverton’s Coolidge McClaine Park is planned for this summer. “We are so close to the finish line and if all goes well we will finally turn on the water fountain for a late August dedication,” according to Christine Carlisle who was commissioned to oversee as the artistic lead and be the volunteer trainer and coordinator in 2015. “This project was fraught with difficulty from the beginning in that the cohort took on an architectural project without a full understanding of the time and funds it would take to mosaic every inch of approx. 616 sq. ft. of this reconstructed depression era wading pool. “The result is nothing short of a wonderment of volunteer determination to create a beautiful legacy for the little town,” she said in an email to supporters. “What remains of the original cohort are a small handful of intrepid members who are raising funds to compensate me for last year’s work as well as bring me on for the final push.” The gofundme account set up last winter is: gofundme.com/communityfountainmosaic. “The most humble offering will make the difference… Silverton has given till it hurts in funds and labor. It makes sense to take this out into the international community,” she said. The project’s Facebook site is facebook.com/cfmosaic. By clicking on the videos by Jaime Furlman viewers can see the people of all ages who have worked along with the cohort members and Carlisle. 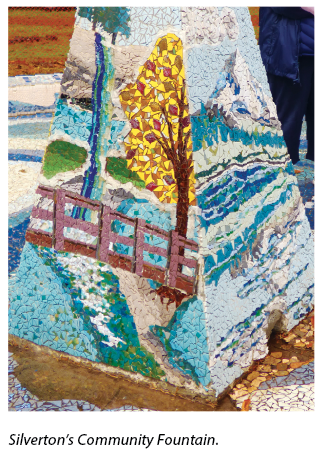 The fountain head was mosaiced by Laura Lucero, a painter who made her first mosaics for this piece, a depiction of Oregon landmarks N,S,E,and W from the center of Silverton. “We are the caretakers of over 200 pairs of hands knees and hearts. The only direction is completion,” Carlisle said.